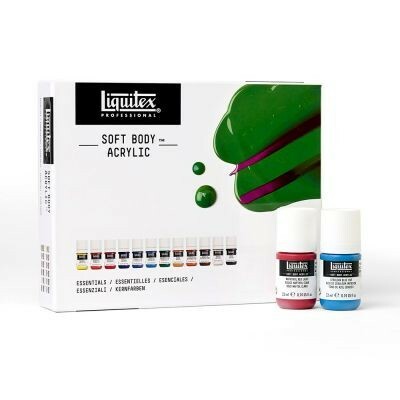 12 x 22ml Liquitex Soft body colours. The perfect way to expand your palette, this set brings together the core essentials and secondary palette colours. Colours: Yell Med Azo, Nap Red Light, Quin Crimson, Diox Purple, Ultra Blue RS, Cerulean Blue Hue, Phthalo Freen BS, Yellow Oxide, Trans Burnt Sienna, Trans Raw Umber, Titanium White, Ivory Black.